Portrait of Dwight D Eisenhower, a Norman Rockwell painting, appeared on the cover of The Saturday Evening Post published October 11, 1952. This is another timeless favorite of Rockwell collectors, a classic for all the ages. This painting was Rockwell's 276th overall out of 322 total paintings that were published on the cover of the Saturday Evening Post. Rockwell's career with the Post spanned 47 years, from his first cover illustration, Boy With Baby Carriage in 1916 to his last, Portrait of John F. Kennedy, in 1963. This was also the second cover for The Post in 1952. In 1952, there were four Norman Rockwell Saturday Evening Post covers published. The original oil on canvas painting, 18.75 x 17.75 inches or 47.5 x 45 cm, is part of the collection of the Norman Rockwell Museum of Stockbridge, MA. on page 192 of Norman Rockwell, A Definitive Catalogue by Laurie Norton Moffatt. One study also appears in the Norman Rockwell Catalogue on page 193. The presidential election campaign of 1952 featured two well respected candidates, Dwight David Eisenhower, a General during World War Two, and Illinois governor, Adlai Stevenson. Norman Rockwell was given the opportunity to meet and paint a portrait of Eisenhower. This painting and several others were the product of that meeting. Rockwell also wrote an article accompanying the portraits in which he confessed to being a fan of Ike's. The other portraits accompanied the article on the inside of The Post. 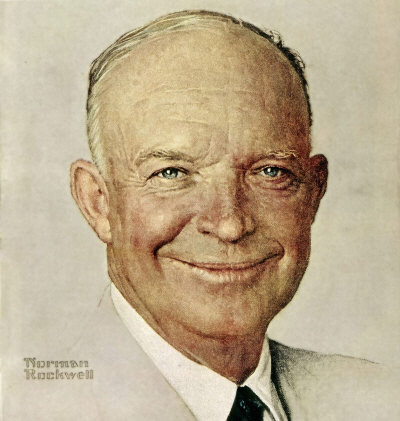 Rockwell also indicated that he enjoyed painting the portrait because of Eisenhower's expressive face. Rockwell also related that he enjoyed talking about painting with Ike. Ike was an amateur painter. Portrait of Dwight D Eisenhower was only one of 322 Norman Rockwell Saturday Evening Post covers; Here is the list of Norman Rockwell Saturday Evening Post cover illustrations. Rockwell eventually, in 1956, painted another cover portrait of Dwight D. Eisenhower for The Post. That painting showed Ike with an even more expansive smile on his face. That, too, was part of the Presidential campaign. Eisenhower, in 1956, once more squared off against Stevenson and emerged as the victorious candidate again. Do You Have A Great Story, Opinion Or Contribution About Portrait of Walking to Church?